Nvidia’s next generation flagship GPU is drawing ever closer to release. Epic Games showed off a demo of their Unreal Engine 3 tech using the Kepler-based hardware during the Game Developers Conference last week, which suggested the new GPU would be faster than at least two GTX 580s. Despite no official announcement from Nvidia, the current top of the line product, the GTX 580 has received a price cut at several retailers, which is a sure sign that the new 28nm Kepler-based GTX 680 is imminent. The price reduction is usually a method employed by retailers to skirt around non-disclosure agreements in order to shift old stock and make way for the new arrivals. So it should be a good indication that we’ll be seeing the new card released shortly. The GPU is rumored to feature 2GB of GDDR5 memory, is powered by the GK104 core and features a 256-bit memory controller with 1536 CUDA cores. A 4GB model is also rumored for future release. What is interesting however is VR-Zone is reporting that the new model will retain the same core frequencies as the current Fermi counterparts, with the core clocked at 705 MHz and the shaders at 1411 MHz. Despite this, the GTX 680 improves on previous memory controllers, setting a new record with the memory clock at 6 GHz, which equates to a memory controller bandwidth of 192 GB/s, identical to the current GTX 580 even though it features a narrower memory bus. It has also been speculated that the new model includes a dynamic clocking feature which operates similar to Intel’s turbo boost as found in their processors, enabling the graphics card to adjust clock speeds in response to performance requirements and operating temperatures. 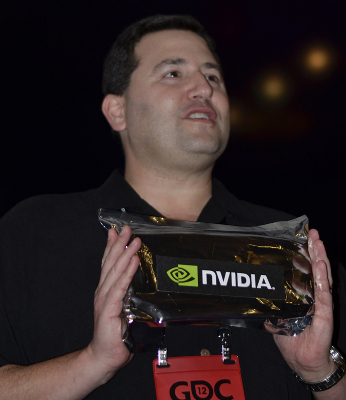 Previous rumors suggest the GTX 680 will hit store shelves around the same time as Intel’s Ivy Bridge hits retail, with a suggested price around $500. Nvidia doesn’t typically comment on speculation, and has not replied to requests for comments, but should the end product match the rumors it looks set to regain the top spot from the recently released AMD Radeon HD 7970.